I guess the title says it all. Yup, this is where I'll be working in Japan...at Ivan Ramen. I first met Ivan back in August of 2008 and instantly felt connected to his passion for ramen. If you know his story, I'm sure you'll understand what I mean. Since then, every trip to Tokyo didn't feel complete without paying a visit. So you can only imagine how I felt last month when I finally got the courage to ask if he could help me fulfill my dream and he said YES! I can't believe I'll soon be learning how to make dishes like these. This is definitely a dream. Please do not pinch me. Click here to see the full menu. So next time you're in Tokyo, please stop by and say hi. Ivan's ramen is amazing and you will not leave disappointed! Click here for directions. You can also use this timetable to find your exact route using Rokakoen as the destination. Ivan, thank you for giving me this opportunity and for being such an inspiration. Words cannot describe how grateful I really am. I promise to work hard everyday and cherish everything you teach me. Once again, THANK YOU! "The masters of renowned shops will come in by the flocks! Smack your lips over selected their specialties." Featuring "Rich Miso Ramen & Rich Shoyu Ramen." As always there will be more than just ramen, including “Fish Cakes” of “Murakawa kamaboko”, “Ijinkan Maki” and “Waffles” of “Kobe-Fugetsudo”, & "Okonomiyaki" of "Otafuku". Check Mitsuwa's website for more details! 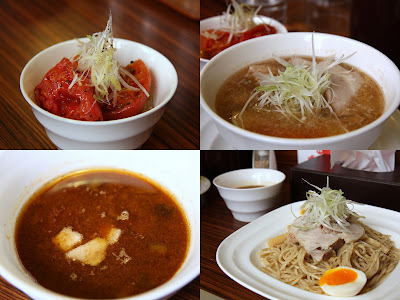 Shanghai Souhonten is consistently in the top 10 when searching the various ramen rankings of Hiroshima City. Since it was so close to my hotel and because they open so early (gotta love Japan! ), I knew I could squeeze a bowl in for a late breakfast. The first thing you notice when you walk in is a huge tub of oden sitting in a nasty-looking vat that appears like it hasn't been washed for years (see second-to-last slide). Apparently it is self serve at 100 yen/piece. I didn't try it because at first I wasn't sure if it was safe, but now I regret it. I bet it was good! Anyway, the ramen here is typical Hiroshima with that strong shoyu flavor that gives me goosebumps. This place, in particular, tasted like I was licking burnt shoyu from a pan. Awesome! The menma also retained that deep shoyu flavor without being mushy. The chashu was fairly dry but still tasted good and the starchy noodles stood up well to match the soup. From Hiroshima station take the Hiroden Streetcar (#1, #2, or #6) to Hatchobori. Then it's about a 5-minute walk in the North direction. You can also take the #9 streetcar from Hatchobori to Jogakuinmae, but I found it better to walk. They are open from 10:30am to 9pm and closed on Sundays. Before I get to the you-know-what, I'd like to reenact, in loosely-translated English, a scene that I found hilarious. I didn't get a chance to video it but you can see someone else's here (via morimrim). R2B2: What were you doing yesterday at that restaurant? R2B1: Huh? I don't know what you're talking about. R2B2: Don't act stupid fool. I saw you! R2B1: What? I was just eating some Japanese barbecue. R2B2: But you weren't alone right?!?! R2B1: Yeah you're right. I was on a date with some girl. R2B1: Yeah...she was just alright. Nothing special. R2B2: Dude, you're talking about my girlfriend!! R2B1: .....bu..but it was nothing. And the rest is a bit violent to describe to all you kids out there but let's just say there were robot guts everywhere...just kidding. After a few attempted stabs from R2B2, R2B1 gracefully dodged them with his condiment-cover shield. Then they quickly made up and began making ramen and calling each other stupid like nothing ever happened. Awesome! I did manage to take an amateur video of the ramen-preparing pair in action. As for the actual ramen, it was just an average bowl of Kumamoto-style tonkotsu. It was good, but not nearly as impressive as the robots. The soup was a bit plain, even with the kuro-mayu (burnt garlic), and the toppings (chashu, kikurage, negi) were fairly standard, although the chashu was pretty good. Anyhow, you can easily tell that most of the shopkeeper's time went into the robots and not the ramen. Hence, if I were to come back again it would be for the robots and probably not the ramen. This next video is of R2B1 spinning a dish on his mechanical finger. R2B2 yells out "wow brother! you're awesome!" and shortly thereafter the dish stops spinning and you see R2B2 turn his back and crouch in shame. hahaha! The last video is of the pair dancing in sync to the music. I guess they do this after their comedic acts are finished and there are no more customers ordering ramen. It's actually quite soothing. So there you have it! The infamous Ramen Robots of Fa~Men. Now go check them out for yourself!! Here are the directions: From Nagoya Station, take the Higashiyama Line (bound for Fujigaoka) to Fushimi. Then transfer to the Tsurumai Line (bound for Toyota) and get off at Oosukannon. Head north and look for a big sign that says Akamon Street. This map should also help. They are open for lunch from 11:30am to 3pm and for dinner from 5pm to 7:30pm. Closed on Wednesdays. My first experience with Chuuka Soba Ichiriki was when they made a brief appearance at the Shinyokohama Raumen Museum last year. And ever since then, I just knew I had to hunt down the original location in Tsuruga. Ichiriki has been around for 50+ years and it's another one of those ramen-ya's that started from a yatai (push cart) near the train station. Although the soup for all the ramen here is the same, the Chashu Ramen is by far the most popular. This "double chashu" ramen starts with a meaty layer of chashu from the pig's leg followed by the juicy fatness of the ribs. Yup! It's that awesome! I decided to get a little crazy and ordered the Chashu Wonton Men. The wontons were tiny, bite-size morsels of goodness that accompanied the amazing "double chashu" in a lightly, rich peppery broth. The noodles were surprisingly curly for being down this far south, but they had just the right bite to them. I'd have to say that this was one of my favorite bowls from my most recent trip. Tsuruga is about an hour Northwest of Nagoya on the Sea of Japan side. Ichiriki is about a 30-minute walk from Tsuruga Station so I recommend taking either a taxi or the bus. If you're cheap like me, then let me tell you how to take the bus. Once you exit the station you'll see a コミュ二ティバスのりば (Community Bus Stop) sign on your left (see last slide above). Get on that bus and head for a stop called Shiyakusho-mae (市役所前). You can get a bus schedule from the info desk at the station which tells you all the times for the bus. Anyway, once you get to Shiyakusho-mae and exit the bus, walk to your left and make a right at the intersection. After a few more steps, you should be able to see Ichiriki on your right. They are open from 11am to 7:30pm and closed on Tuesdays. To get back to the station just hop on the same bus from the opposite side of the street.